Posted May 15th, 2014 by iaps & filed under PHP Development. For years we have been utilizing a small class that allows us to easily debug PHP applications. All you need to do is add your IP to the $ips array in the debug::enabled() function. This script uses backtrace, which may not be available to you, to look-up the file and line of where debug::print_r() was called. It then prints out that information, along with the variable passed to the function. You may download the script from here (links to a .txt file): debug.php.txt. The WordPress plugin can be found here: debug-print-r.
Posted May 13th, 2014 by iaps & filed under Hosting. All client hosting accounts have a utility called SpamAssassin. This utility works to reduce the amount of spam that comes into your inbox. However, Spam Assassin is not enabled by default. If you are experiencing a lot of spam email, login to cPanel (Client Hosting Login) and under the “Mail” section click on “Spam Assassin™”. 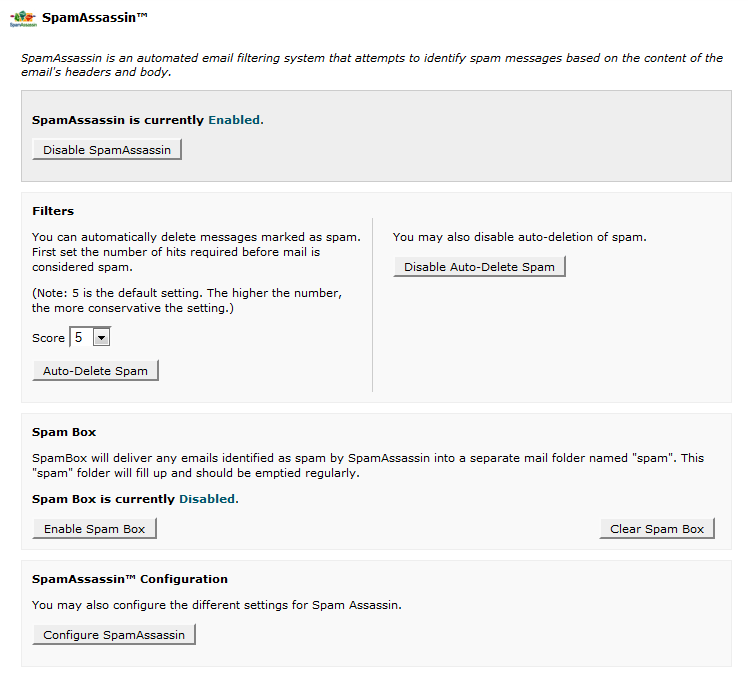 If SpamAssassin is not enabled, which it is not by default, then click the button labeled “Enable SpamAssassin”. The default threshold is 5/10, which should be a good starting point. If you notice valid emails going into spam, you may want to increase (>5) the SpamAssassin score, and if too many spam emails are still getting through, you will want to decrease (<5) the score. In essence, the greater the spam-score given to an email, the more likely it is to be spam. Furthermore, messages will only be marked as spam, and they will still end up in your inbox. To automatically send these spam messages to the spam folder, enable “Spam Box” as well (see screenshot to follow). Finally, if you want spam messages to be deleted automatically, without ever reaching your inbox, you may click the “Auto-Delete Spam” button, under the SpamAssassin score. Posted May 13th, 2014 by iaps & filed under PHP Development. There have been some issues with mod_rewrite, WordPress and the permalink functionality. In some cases, when having mod_rewrite enabled, WordPress fails to load the Settings > Permalink page. Some people experience a blank screen, while others experience a 404 Page Not Found error. Posted February 17th, 2014 by iaps & filed under flokah.com, ubudget.ca. In the next few weeks we will be releasing several updates to ubudget, including additional changes to mobile views and a small Inventory manager that will replace the SKU field in the Point-of-Sale (POS) module. This replacement will not cause any issues with previous POS-based invoices, as they will still utilize the SKU field until updated. However, all new POS logs will use the Inventory manager to reference products and services. The Inventory manager currently includes options to add and manage Manufacturers, but it does not currently support Categories, which we plan to add in a future revision. Posted January 26th, 2014 by iaps & filed under flokah.com, ubudget.ca. Today marks the 6 year anniversary of ubudget, and on this special occasion we bring you some insight into our development goals of 2014. Our first goal is to redevelop the entire ubudget interface so all content and forms can be easily read and used on your mobile devices. Instead of developing and releasing everything at once, we are instead going to release these new interfaces one at a time. We have already implemented a Quick Entry form for Journals and updated the interfaces for Journals and Worklogs. Our second goal is to finish the, nearly complete, Journal Import system, with the initial release supporting .csv files. As always, please let us know if you have any suggestions or feedback! Posted January 15th, 2014 by iaps & filed under flokah.com, ubudget.ca. Posted November 8th, 2013 by iaps & filed under Notices & Alerts. We had this problem for the last year or so, intermittently, on one of our systems. The screen flickered black, then a windows bubble popped up with the error message “Nvidia Kernel Mode Driver has stopped responding and has recovered.” We read through tons of forum posts, looking for ways to fix this issue. Some solutions include: changing the TDR Delay in the registry, reinstalling the video drivers, installing old versions of drivers, changing Nvidia settings to use Maximum Performance, and the list goes on. But after going into the BIOS to take a look at GPU temperatures, we saw that Nvidia “Optimus” was disabled, so we enabled that and there hasn’t been a flicker or error since. Optmius delegates commands, depending on load, to your GPU and integrated graphics chip. This seems to have alleviated some graphic lag we were experiencing on this system as well. It has only been a few days since we enabled Optimus, but we are staying optimistic. Please leave a reply if this solution worked for you. Posted October 21st, 2013 by iaps & filed under flokah.com, ubudget.ca. Posted September 20th, 2013 by iaps & filed under Notices & Alerts. We are aware of an issue involving captcha at support.iaps.ca. We are working hard to fix this issue. If you need to contact us, please use our general contact form for now. We apologize for any inconvenience this may cause.